The Children's Bed from the debe.deline Collection by de Breuyn is perfectly formed, very simple in design and looks more like a miniature bed for adults. Every type of room that is shared by adults and children can be superbly furnished with furniture from the debe.deline Collection. All furniture is deliberately kept low, to suit the sizes of the children using the furniture. The small children's bed has a 70 x 140cm mattress. It is intended to succeed the baby cot and is suitable for children from about one and a half to two years or older. The high headboard with the two raised sides prevent falling out of the bed. Little sleepyheads can feel comfortable in this absolutely timeless and understated bed. 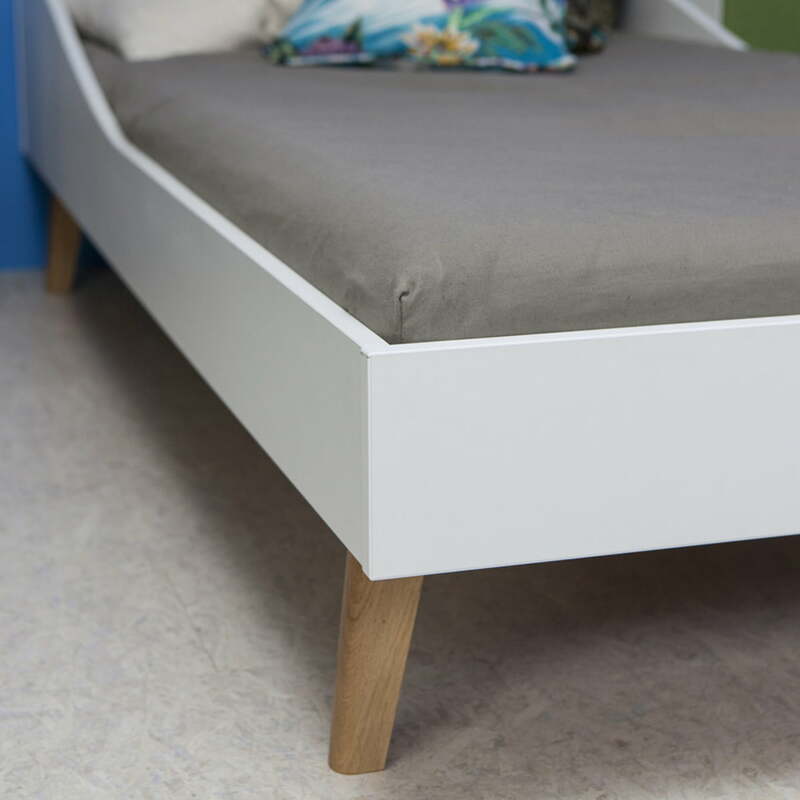 The frame of the debe.deline Children's Bed by De Breuyn is made of white low-emission melamine board. It is hard-wearing and easy to clean. The feet are made of solid oiled oak. A fixed slatted frame made of solid beech is included. Individual product image of the debe.deline Children’s Bed by de Breuyn with slatted frame. 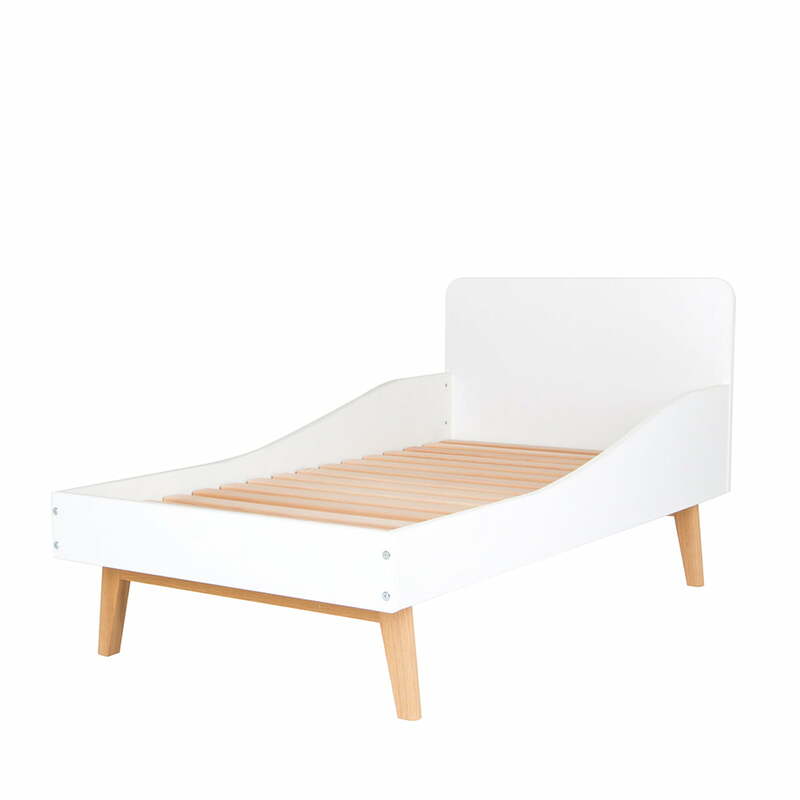 The small children’s bed from the debe.deline collection has a 70 x 140cm mattress. Individual product image of the debe.deline Children’s Bed by de Breuyn with mattress. The frame is made from low-emission white melamine and the feet are made of solid oiled oak. The Children’s Bed from the debe.deline Collection by De Breuyn is perfectly formed, very simple in design and looks more like a miniature bed for adults. The small debe.deline Bedside Table with drawer by de Breuyn is a great addition to the debe.deline children’s bed made from lo-emission melamine board. The small debe.deline child's bed has a mattress dimension of 70 x 140cm. It is intended to succeed the baby cot and is suitable for children from about one and a half to two years or older. The frame of the debe.deline children’s bed by de Breuyn is made of white low-emission melamine board. It is hard-wearing and easy to clean. The feet are made of solid oiled oak.